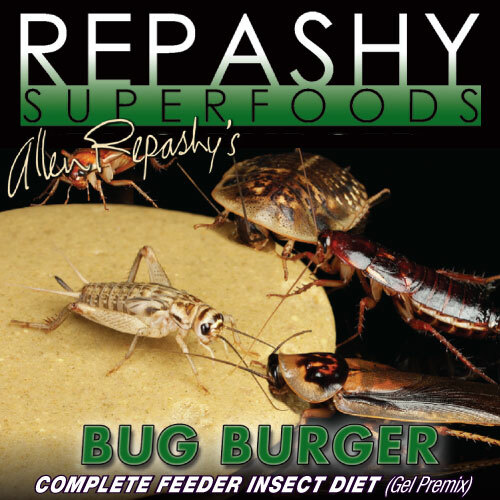 Our Complete Diet for Crickets, Roaches, and Other Insects. Three ounces of powder makes 1.25 pounds of finished gel feed. Feeds AND Hydrates. Calcium Fortified. INGREDIENTS: Stabilized Rice Bran, Corn Meal, Brewer’s Dried Yeast, Alfalfa Leaf Meal, Ground Flaxseed, Cane Molasses, Calcium Carbonate, Dried Seaweed Meal, Lecithin, Locust Bean Gum, Dried Kelp, Dried Watermelon, Rose Hips, Cinnamon, Hibiscus Flower, Marigold Flower, Paprika, Turmeric, Citric Acid, Potassium Citrate, Salt, Calcium Propionate and Potassium Sorbate (as preservatives), Magnesium Amino Acid Chelate, Zinc Methionine Hydroxy Analogue Chelate, Manganese Methionine Hydroxy Analogue Chelate, Copper Methionine Hydroxy Analogue Chelate. Vitamins: (Vitamin A Supplement, Vitamin D3 Supplement, Calcium L-Ascorbyl-2-Monophosphate, Vitamin E Supplement, Niacin, Beta Carotene, Pantothenic Acid, Riboflavin, Pyridoxine Hydrochloride, Thiamine Mononitrate, Folic Acid, Biotin, Vitamin B-12 Supplement, Menadione Sodium Bisulfite Complex). Guaranteed Analysis: Crude Protein min. 13%, Crude Fat min. 4%, Crude Fiber max. 10%, Moisture max. 8%, Ash max. 18%, Calcium min. 4%.